Home and Garden Show owner, Randy Phillips with Mariah, Candace and Matt at 2016 Showdown. If you’re a fan of the FoodNetwork show Chopped, you’ll want to see this live, local version of the culinary face off where Dayton chefs face off against each other in three rounds of preliminary competitions. Given just 20 minutes to turn a surprise basket of ingredients and use of the Whole Foods Pantry into a palate pleasing appetizer, as judged by a panel of local foodies. This Chef Showdown will take place at the Dayton Home and Garden Show at the Dayton Convention Center this Saturday. Dayton’s best chefs battle it out for $500 and bragging rights. Preliminary Competition rounds are Saturday at 11am, 1pm and 3pm and one contestant from each round will advance to the finals, which will take place on Sunday at 1pm. In the final round, the time is increased to 30 minutes, but so are the expectations, and chefs will have 4 ingredients to turn into an entree. 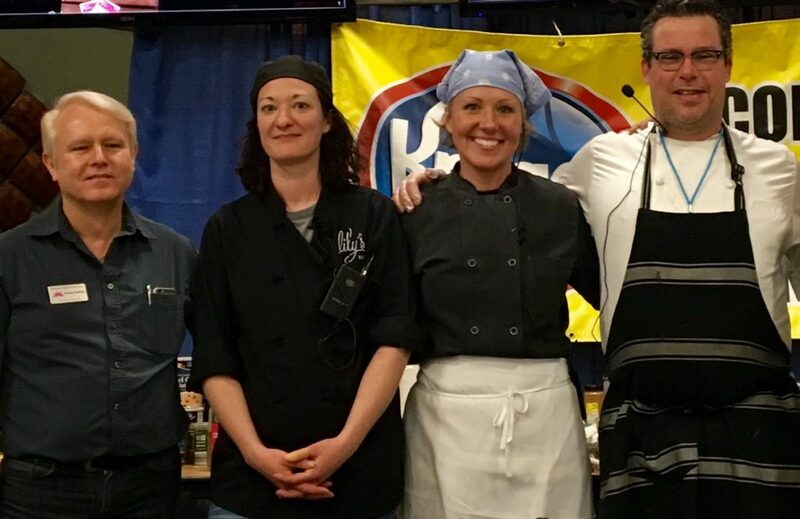 Defending her title, last year’s champion is Chef Candice Rinke, chef and owner of the seven-year-old Kettering restaurant Hawthorn Grill. She competed in last years first round in the morning and despite the challenge of opening canned ingredients without a can opener, she managed to advance to the finals with her chicken appetizer on a pita triangle. In the finals she turned the five mystery ingredients that had to be used to create an entree — shrimp, asparagus, black beans, canned peaches and canned tomatoes into a fresh, flavorful dish with a beautiful presentation into an Italian-inspired bread salad. Chef Mariah Gahagan is an Executive Chef who’s worked at many of Dayton’s finer restaurants. She grew up in Yellow Springs and started working at the Wind’s Cafe in high school, but had always planned to pursue an art degree. Flash forward years later and Gahagan will tell you that while she never imagined becoming a chef, she now couldn’t see herself being anything else, and that her love of art (specifically color combinations) plays a substantial roll in her approach to cooking. Her other culinary ethos is a focus on seasonally-oriented cuisine, as it encourages enjoying food when it is at its best. Chef Mariah was victorious last year in her preliminary round with a salmon dish that flowed with a perfect melody of flavor, from edge to edge with greens and avocados. This year she’s back, but a change of employment has her competing for Wheat Penny. Chef Matthew Hayden has a reputation as an innovative, forward-thinking Chef who makes unforgettable food. He catered such flagship events as ARC Ohio’s “party of parties”, Masquerage and Antioch College’s Reunion Weekend. Chef Matthew proudly offers his talents to his native city and devotes a healthy amount of time to the community. He supports numerous non-profit services in Montgomery County as well as being an ardent patron of the local arts. After 15 years of operating successful food service businesses in the Miami Valley, Chef Matthew Hayden decided to create his dream business. Scratch Food uses his entrepreneurship and culinary creativity to provide prepared meals with a cutting edge model of nutrition that benefits cancer patients as well as reducing risk of numerous other lifestyle dependent diseases, most notably Type II Diabetes and cardiovascular disease. Also back for a second chance at the title, from Wheat Penny is Chef Crystal Coppock. Just celebrating her 3rd anniversary at Wheat Penny where’s she is the Sous Chef, Crystal has loved cooking since a young age, noting her late grandmother as her first major culinary influence. Today, Crystal still finds inspiration in her grandmother’s Southern-influenced cooking, but also thrives on continuously learning new concepts, such as making pasta by hand. It’s been a big year for Crystal, as she’s bought her first house and recently become engaged. She shared that after last year’s event she bought a copy of The Flavor Bible and has really been educating herself about culinary creativity. Chef Aaron Braun‘s culinary interest began in his Mother’s kitchen in Kettering, but was probably inherited from his Grandfather, who immigrated and opened a small restaurant in Dayton. Appreciation for good food and gatherings around the family dinner table inspired Aaron to seek employment in local restaurants at an early age, and later to obtain Culinary and Business Degrees from Hocking College in Nelsonville, Ohio. He further broadened his cooking horizons on Put-in-Bay and then moved on to San Diego. In California, Aaron promptly found employment at Silvergate Yacht Club, and then a 44-acre, private island resort; Paradise Point. It was at this luxury resort that he was able to really grow, eventually becoming the Chef of their fine dining establishment. After getting married and traveling across the country, Aaron’s dedication to family and devotion to his hometown have brought him back to Dayton, where he has had the privilege of working for Wiley, as Meadowlark’s Sous Chef, for the past four years. This is also Aaron’s 2nd chance competing in the Showdown. Chef Maria Walusis is the chef and owner of Miamisburg’s Nibbles restaurant, which just announced an upcoming move and expansion for the 2 year old eatery. Before that she owned and operated Nibbles Catering for about 5 years, She received most of her training by a combination of apprenticeships with Dayton and Cincinnati top chefs, and by studying culinary textbooks from the Culinary Institute of America. This is her second career and it took a lot of time, focus, passion and drive to become chef /owner of a fine dining restaurant in a fairly short time frame. In her free time she likes to study and read constantly to continue to learn and grow as a chef and keep up with the industry and trends. Another newcomer to the competition, Chef Amy Finch is the Chef de Cuisine at Lily’s Bistro, an independent restaurant in Dayton’s historic Oregon District. Lily’s features eclectic American comfort food + drinks in a “nice dining” atmosphere. Chef Finch knew she wanted to be a chef when she was 7 years old and learned how to make scrambled eggs. She began to pursue her culinary arts degree in 1994 right after high school–“just long enough until life got in the way,” she says. After one year of school she took an unintentional 18-year break, and not only worked for her family’s event rental business, but cooked at various regional restaurants like The Peasant Stock, Sidebar, Neil’s Heritage House, and Kohler Catering. She has been with Lily’s since they opened in spring of 2013, finished her culinary arts degree from Sinclair in 2015, and took the reigns as CDC at Lily’s in fall of 2016, bringing to the restaurant her love of food that is “just plain good,” especially comfort food of the mid-west and south that she grew up on and loves to cook. Competing in the Showdown for the first time, Chef Rae Rosbough went to the MVCTC in Clayton, Ohio for Restaurant Management. She then attended Johnson & Wales University in Providence, RI where she received her Associates and Bachelor’s Degrees in Culinary Arts. She studied abroad in Chester, England during her Senior year and was then inducted into the Management Development Program at JWU; where she worked as an instructor in exchange for my Master’s Degree in Teaching Culinary Arts. She came back to Dayton in 2002 and started her career here at Mediterra. Throughout the years she moved up to become the Executive Chef at five independent restaurants. Cafe Boulevard, Cena, Boulevard Haus, Crazy Mango and finally Trolley Stop. She love the Dayton community, especially her home, the Oregon District. Chef Aimee Please has no formal culinary education outside of a online class about catering. However, she does have 30 years of experience in the restaurant industry that will be put to the test this Saturday. We first met Aimee at our 2005 Sweet Treats Festival, where she was serving up tasty desserts. 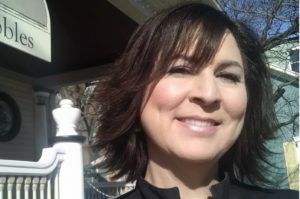 She is currently the owner of Thyme After Thyme Gourmet and the kitchen manager at Bargos. Past positions held include kitchen manager at Whiskey Barrel, sous chef at Else Cake Company Wine Bar and Bistro as well as Waynesville’s Cobblestone Cafe and executive chef at Ollie’s Place. She has dubbed herself the underdog in this competition, but we sure don’t, we’ve seen her tenacity and certainly expect her to bring it for this weekend.